CLICK HERE for all our safety floor stickers and decals. Our Forklift Safety Signs have both High Visibility and High Impact to help prevent forklift accidents. 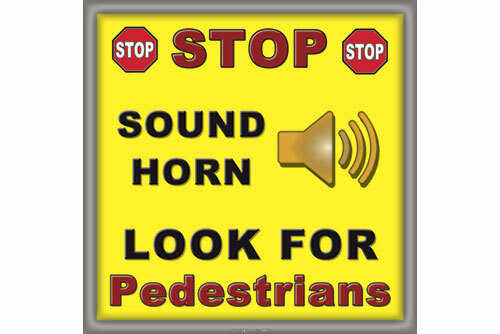 Our forklift safety signs come in a variety of options - Rack Banners, - Aisle Signs, Hanging signs and - Floor Stickers. We invented the pallet rack safety banner. 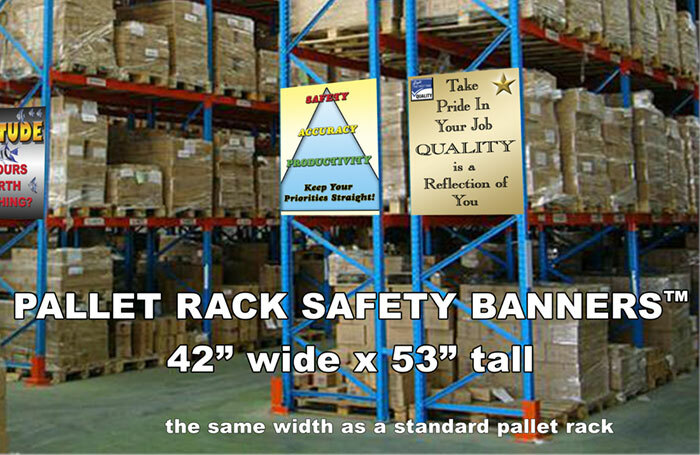 (see below) Many of our rack banners promote forklift safety as well as general industrial safety. 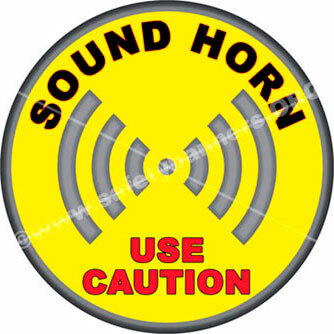 Below is a listing of our various forklift safety signs products. 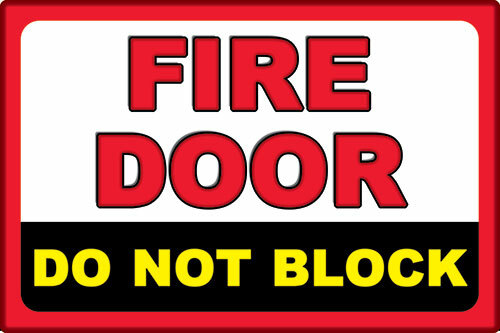 Need a unique or custom forklift or warehouse safety sign? Call Cyndi at 901-759-0932, or email her by using the email link in blue above right to tell her what you need. We GUARANTEE your satisfaction with our design work. Try us out. If you need custom forklift safety signs, Cyndi is your Go To Gal. - No drilling or screws required! 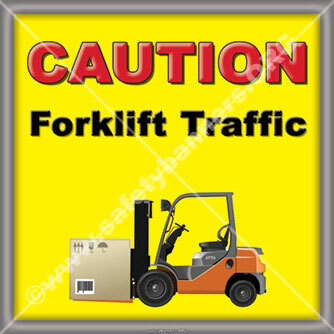 -- We have over 300 different forklift and industrial safety sign images available in a wide range of sizes. Use anti-slip Safety Floor Stickers & signs (floor signs) in any facility - warehouse, office or any where you want a safety emphasis. Every supermarket in the U.S. and most retailers do it - place advertising images on the FLOOR - because they get your attention!!! Isn't that what it's all about. Getting the employees to pay attention to safety - SAFETY AWARENESS. Place any Caution / Notice / Warning image on your facility floor as / Safety Floor Sign / Safety Floor Sticker / Safety Floor Decal. Our Safety Floor Power Stickers / Signs / Decals are made from the very best materials in the business and made to last on your facility floor. Over the image surface we apply a VERY ROBUST (Forklift-Tough®) poly carbonate over laminate that can take a beating and keep on ticking - even from your forklifts - and they are anti-slip. (We use the industrial grade anti-slip over laminate! The standard vinyl over laminate others use is meant for grocery store floors - NOT INDUSTRIAL FLOORS!) Plus, our adhesive is a specially formulated adhesive which will stick securely to your floor, but can be removed with the application of heat and serious elbow grease. They are easy to apply yourself. No need for an expert to come in an apply your safety floor stickers or signs. We have four standard sizes for our safety floor power stickers & signs, but we can make them ANY SIZE you need - just ask. PLUS, our designers will put together completely custom safety floor stickers just for you, at NO Charge. 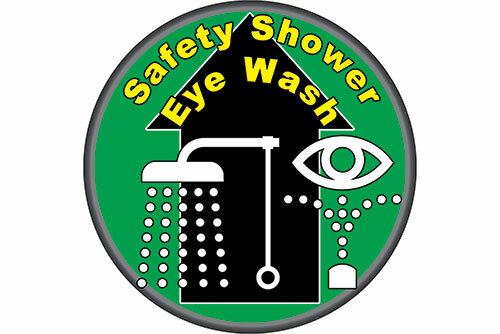 Other Companies make YOU design your own safety signs! 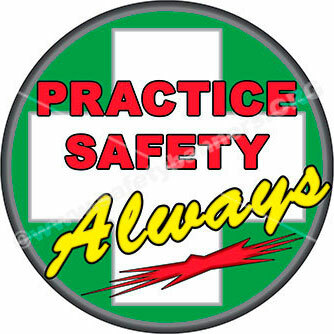 At SafetyBanners.Org WE DO IT FOR YOU! Call Cyndi at 901-759-0932 and tell her what you need and she will make your custom safety sign floor stickers happen - Just for you. YES - Our designers will design COMPLETELY CUSTOM OSHA Compliant Safety Floor Sticker Signs, or any other sign, for your specific facility needs. Have a need? 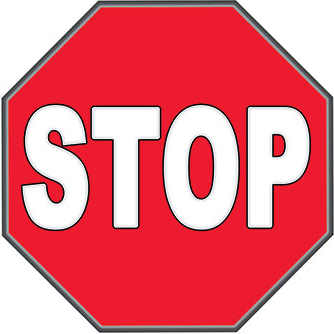 Call us now at 901-759-0932 to tell us what you need on your safety floor signs. We will make it happen and make sure it is OSHA Compliant. 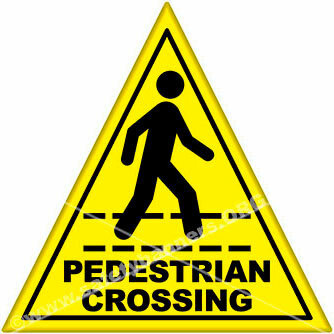 Anti-Slip Warning safety floor stickers, decals and floor signs can significantly enhance your safety operation. Retailers use them on floors to get attention because they work! Putting your safety warning or information message on the floor will warn employees of dangers, cautions and rules of your facility. 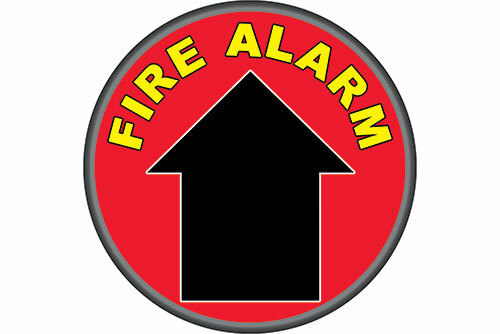 Plus, they can also provide guidance for employees to find specific items are areas like fire extinguishers or emergency showers. Messages on the floor often get more attention and provide more reinforcement than posters or signs on the walls. On the floor, employees see them over and over. On the walls, the signs often get lost in the background and ignored over time. Remember, your people are not going to stand in front of a decal or sign and take time to read and absorb the message. Just like in a retail store, they will take a quick glance. You have just a second or two for them to read and retain the message.